After launch, spacecraft and instruments are guided in both their flight and their scientific data-gathering using commands from mission operators at our in-house facilities using ground stations around the world. 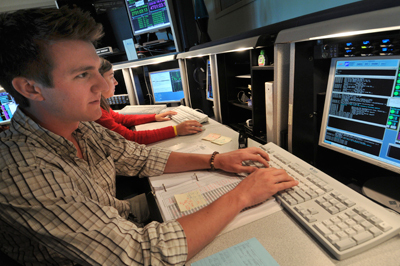 LASP has two such facilities for spacecraft operations, called Mission Operations Centers. LASP currently operates four satellites from these Mission Operations Centers. Examples of commands that mission operators might give a satellite are powering on or off specific instruments, changing the tilt of solar panels, or pointing an instrument in a particular direction to take specified data. LASP uses a worldwide network of sophisticated ground antennas and satellites to relay signals between the Mission Operations Centers and the spacecraft we control. One of the most exciting and unusual aspects of mission operations at LASP is the opportunity for CU undergraduate students to become certified mission operators. Our student operators, who must pass a summer-long course held at LASP, work under the supervision of professional staff to operate billions of dollars worth of spacecraft.